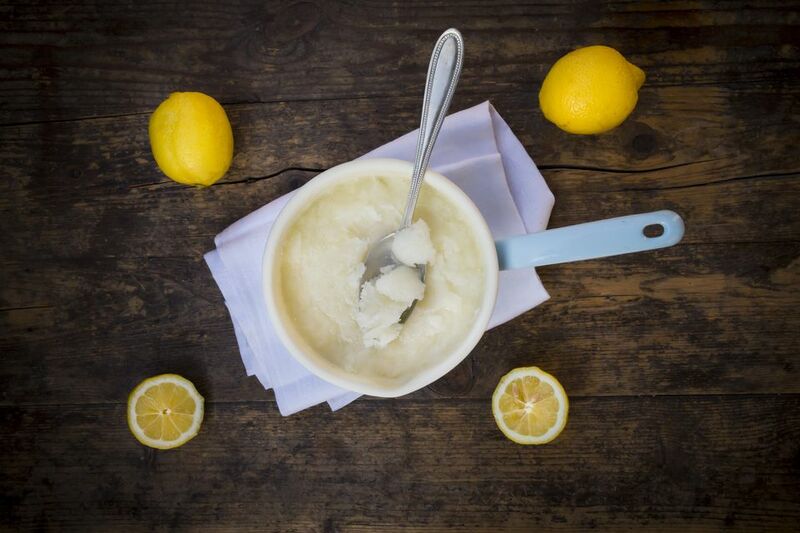 A traditional Italian recipe, lemon ice is the perfect refreshment on a hot summer day. With just a few ingredients and a few hours' time, you will have a deliciously sweet and tangy treat that you can keep on hand when the warm weather arrives. In order to get that fluffy texture, you will need to agitate the mixture every once in a while as it is setting up in the freezer. The smooth consistency is what distinguishes Italian ice from the more crystalized ice desserts called granita and shaved ice. Bring water to a boil. Add sugar and stir until dissolved. Allow water to cool; then add lemon zest and juice and stir to combine. Pour mixture into a baking pan and place in freezer. Gently stir the crystals every 30 minutes or so and leave until all of the liquid is crystallized but not frozen solid, and the mixture is smooth, about 3 hours. If you find that the lemon Italian ice has become too hard, use a large metal spoon to scrape the mixture and break up the ice crystals. Serve immediately. You can make this recipe ahead of time if you like and store in the freezer, covered, for up to 4 days. Either thaw a bit in the refrigerator before serving (until it is no longer rock hard and you can somewhat easily scoop with a spoon) or break into chunks and place in a food processor and pulse until smooth. If you prefer your Italian ice slushy, remove from the freezer sooner once it has reached the desired consistency. Do not use bottled lemon juice for this recipe, and when zesting the lemon be careful not to include the white pith—both will leave the Italian ice tasting very bitter. You can add a bit of mint either to infuse flavor into the Italian ice, or as a garnish at the end. To give the finished dessert a bit of a mint flavor, add fresh mint leaves with the lemon zest and juice and allow to steep for 20 minutes or so. Remove the herb before pouring mixture into pan and freezing. For garnish, simply place a leaf or two on top of each serving. You can also top with a lemon zest twist. If you would like to turn this recipe into an adult treat, you can include a bit of liqueur such as Grand Marnier or Cointreau. Add up to a teaspoon of the liqueur along with the lemon juice and zest. You can use this same recipe and technique with other citrus fruits including limes, oranges, and even grapefruit. Enjoy This Fat-Free Vegan Sweet Treat -- Strawberry Sorbet!